What do you want from your front yard? You may want shade trees and a big lawn that merges with the neighbors’. Or maybe you want a courtyard — an approach that has worked in Spain for hundreds of years — that provides privacy from a busy street. The plan shown here is spacious and simple with a big lawn, shade trees, and evergreens creating a green, park-like effect. Guests have a pleasant walk to the front door any time of the year. Mixed perennials add bursts of seasonal color. A gracious fieldstone walkway: You can vary your walkway in size, shape, and the material you use. This walk leads from the driveway to a spacious front stoop. 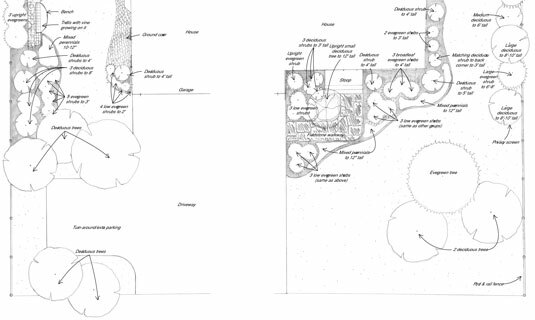 A turnaround to allow for extra parking: Deciduous trees help define the turnaround area, as well as create a little mystery and screening for the side yard planting. A deciduous tree to add vertical interest to the front entry: A tree that’s so close to the house shouldn’t exceed 12 to 15 feet in height. It should also have an upright growth habit, so that it won’t block the view from the front door or jut into the walkway. Mixed evergreen and deciduous shrubs: These plants provide privacy where it’s needed — on the property lines. Remember that deciduous plants won’t provide much privacy during their leafless season, so don’t use them where all-year screening is critical. Foundation plants that are compact, for low maintenance: Choose varieties that grow no taller than 4 feet (except for the plants at the corner, which can reach 6 feet, unless roof eaves don’t allow room). Repetition in plantings: To provide continuity, the front entry planting has three groups of the same three low-growing masses of evergreens. And note that the same deciduous shrubs are used on both sides of the front door. Think of a front entry garden as your personal way of greeting visitors. This part of your yard is a personal statement, and it can reflect you — your favorite plants, touches of outdoor decoration, a wreath on the door at the holidays. Of course, you also have to think of the mailman and others who use the entry for practical purposes — they should at least be able to find the front door. And speaking of the practical, you want something that’s not unreasonable to maintain and keep tidy. Remember that this is the one part of your yard that you use every day of the year.